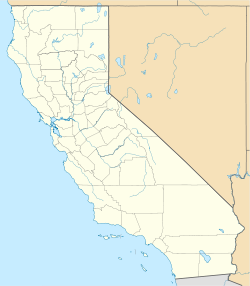 Crucero, California is a ghost town in San Bernardino County, California. It was located at the junction of the Union Pacific Railroad (originally the Los Angeles and Salt Lake Railroad) and the Tonopah and Tidewater Railroad. Originally named Epsom, it was renamed in 1910 for the Spanish word for crossing. A post office existed at Crucero from 1911 to 1917 and from 1922 to 1943. Following the abandonment of the T&T, the settlement was also abandoned. ^ "Crucero". Geographic Names Information System. United States Geological Survey. Retrieved July 30, 2015. ^ Gudde, Erwin (1960). California place names: the origin and etymology of current geographical names (2nd ed.). Berkeley: University of California Press. OCLC 480318. This page was last edited on 8 May 2018, at 21:17 (UTC).